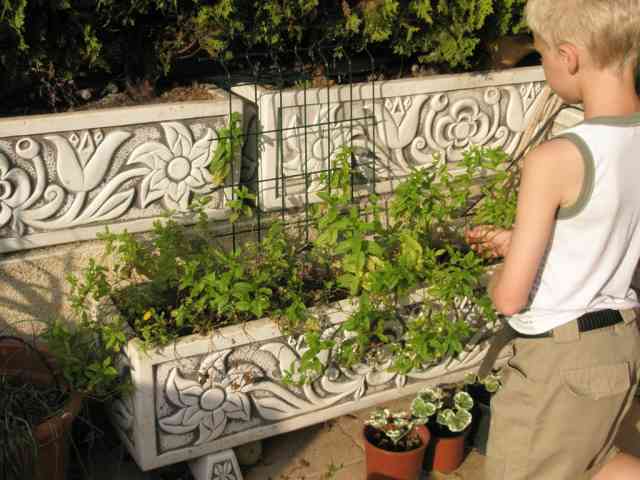 Kids are usually very interested in anything that involves digging in the dirt, and if you have not given your kids their own little garden patch or large container already, now is a good time as it will keep them busy throughout the summer, as well as giving you a shared interest and a lot to talk about. It is also a great way to clean up and get rid of all those left-over bulbs and seeds lying around on shelves and in drawers. Although planted out of season, it is still great fun for the children (and you) to see what comes up of flowers, vegetables, etc. My kids love this little �summer experiment�, especially if anything edible comes up. If you have no �left-overs�, buying a few different seeds is no big expense. If you are buying the seeds you even have the luxury of being able to choose seeds for autumn/winter flowers or vegetables with an almost guaranteed success. 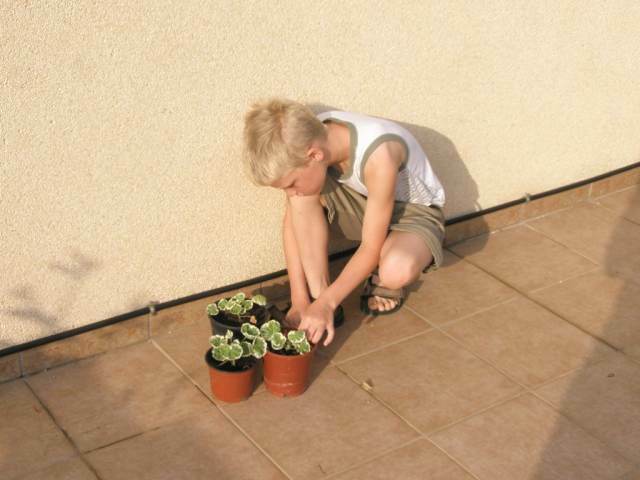 Children often appreciate the miracle of seed germination more than adults. Planting a seed brings out nurturing instincts. As the seed germinates and grows, it is impossible not to become attached to the plant. With each passing day, the emotional investment in the plant grows, as does the plant. And then, the first flower bud appears and opens its petals. It is so exciting! That first blossom is the ultimate reward for their diligence - a wonderful sense of accomplishment that boosts self-esteem. - Ginger root: Sections of fresh ginger root are planted in soil in pots or empty milk cartons. A month after planting, the root sections begin sprouting "bumps" which eventually become stems, then fascinating plants. - Bean: Fill a glass with damp cotton and place a bean between the cotton and the glass. Very quickly it will start to grow and the kids will be able to see through the glass how it develops. Later you can plant it in a pot or in the garden. - Mango: Remove the flat bean-like mango seed from inside the thick cardboard-like husk and plant it at soil level. A fast-growing red-leafed tree begins growing in three weeks and becomes an impressive indoor tree. If you take care of your mango tree, it will bloom and bear in three to six years. - Water circulation inside plants: Place carrots or celery with intact leaves in glasses of water colored with food coloring. Let the kids observe how the colored water travels through the plant tissue. - Plant growth and light: Plant radish seeds in a jar stuffed with damp cotton. Seeds germinate and grow in the direction of the sun regardless of which way the jar is turned. - Pineapple pot: Buy a pineapple and cut off the top with the leaves, leaving about 2cm of the fruit. Plant the top in a pot so the soil covers the base, but not the leaves. Water it and watch it grow. It is a very pretty plant and in about a year or two it might bear fruit itself. - Seed pod animals: Make funny animals of different seed pods or pine cones. 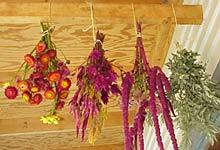 - Drying or pressing flowers and plant parts. Pressing flowers is an easy way to preserve them and an ideal approach if you want to use the blooms for field guides, herbaria, cards, and other creative projects where flatness is fancied. Buy a cheap picture frame and let the kids make their own floral picture for the wall. Or let them glue dried flowers and plant parts onto a piece of cardboard. 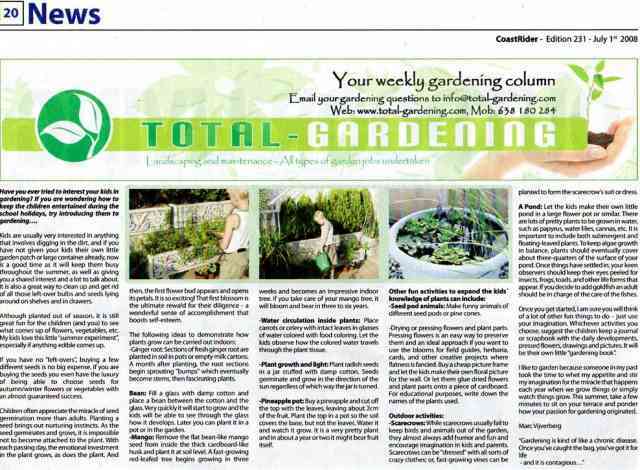 For educational purposes, write down the names of the plants used. - Scarecrows: While scarecrows usually fail to keep birds and animals out of the garden, they almost always add humor and fun and encourage imagination in kids and parents. Scarecrows can be "dressed" with all sorts of crazy clothes; or, fast-growing vines can be planted to form the scarecrow's suit or dress. 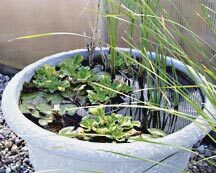 - A pond: Let the kids make their own little pond in a large flower pot or similar. There are lots of pretty plants to be grown in water, such as papyrus, water lilies, cannas, etc. It is important to include both submergent and floating-leaved plants. To keep algae growth in balance, plants should eventually cover about three-quarters of the surface of your pond. Once things have settled in, your keen observers should keep their eyes peeled for insects, frogs, toads, and other life forms that appear. If you decide to add goldfish an adult should be in charge of the care of the fish. Once you get started, I am sure you will think of a lot of other fun things to do � just use your imagination. Whichever activities you choose, suggest the children keep a journal or scrapbook with the daily developments, pressed flowers, drawings and pictures. 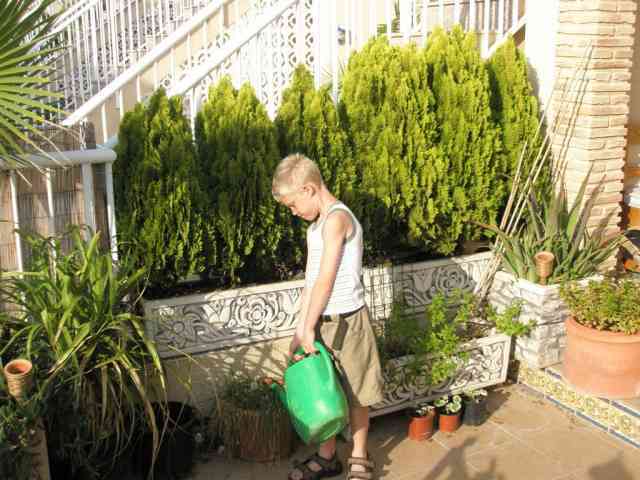 It will be their own little �gardening book�. I like to garden because someone in my past took the time to whet my appetite and stir my imagination for the miracle that happens each year when we grow things or simply watch things grow. This summer, take a few minutes to sit on your terrace and ponder how your passion for gardening originated.